The NIV Cultural Backgrounds Study Bible states that,“conclusions sometimes summarized key points in a work; love is once such point.” When we seek direction, does Love have the final say on our propelled steps? In Matthew Henry’s Commentary, he states many reasons the Corinthians were instructed by Paul to “be on guard.” There were people looking to deceive and corrupt their faith, to manipulate their direction. "A Christian is always in danger, and therefore should ever be on the watch,” Henry stated. Even today, we must stay alert to the current status of our life’s direction. God’s direction for our lives isn’t always easy to traverse. In fact, we’re guaranteed that it most certainly will be hard in this life. Courage and strength, supplied by the Father’s love flowing through us, help our feet forge the path that is purposefully ours to trod. Ephesians 6:10 says, “be strong in the Lord and in his mighty power.” (NIV) Strength and power were ideals used to praise God. We’re not to called to rely on our own strength, but to surrender to the One who is strong enough to sustain us. “He must hold firmly to the trustworthy message as it has been taught, so that he can encourage others by sound doctrine and refute those who oppose it.” Titus 1:9We can all glean some knowledge about the directional sway of our hearts from Paul’s instruction to Titus regarding the selection of elders. The Zondervan Bible Commentary states Paul’s instructions included that they“must hold firmly to the trustworthy message, and in this insists that he is required to have not only a tenacious grip of the faith, but also a firm adherence to it in conduct.” The truth was to drive their direction and supply their confidence. Jesus Christ’s residence in our hearts through the indwelling of the Holy Spirit when we accept Him as our personal Savior, empowers us to set the directional compass of our hearts to His love. His compassion compelled Him to come to earth. His direction was certain …the cross. He unwaveringly obeyed His Father, and crushed the punishment of sin forever. Taking every one of our names upon His heart as He hung there, there is power in the greatest love of all. Power to steady our direction …as we follow His feet. Praise You for Jesus’ sacrifice. His perfect love defeated sin on the cross. Your perfect love for us carries a theme of redemption. Thank You for loving us perfectly, and for layering our lives with unique purpose. When it’s hard to find direction, forgive us for choosing paths that lead us away from Your love. Bring us back time and again, as we strive to be strong, courageous, and obedient to You. Bless our hearts to know the direction that You have mapped out for us. Help us to drift through seasons of discouragement focused on Your Word and Your promises. 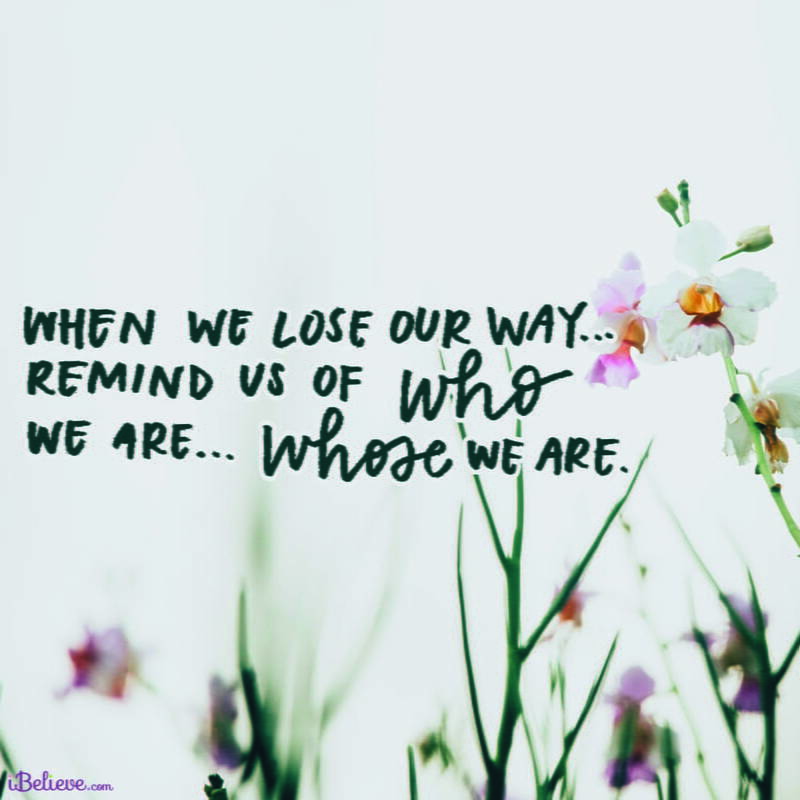 When we lose our way, remind us of who we are …Whose we are. In Jesus’ Name, Amen. Meg encourages others to seek Him first through her life as a stay-at-home mom, career as a freelance writer, teaching Emoti-moms Weekly Bible Study, and leading the kids worship teams at her local church. She resides in a small, Northern lake town with her husband of ten years, two daughters, and their Golden-doodle. Megwrites about everyday life within the love of Christ on her blog, http://sunnyand80.org.